Scrappy Doo - Stop staring and start sewing! 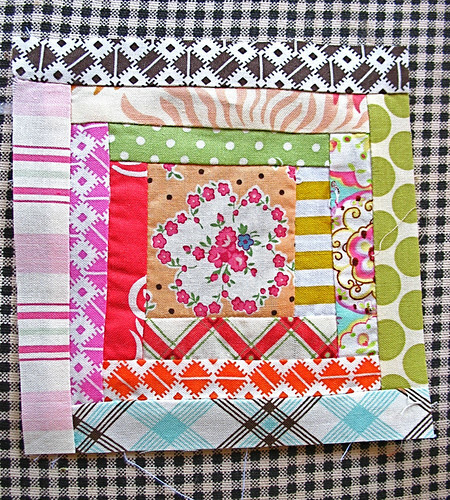 I was so inspired by this fun tutorial I decided to put my scraps to good use and start some quilting. 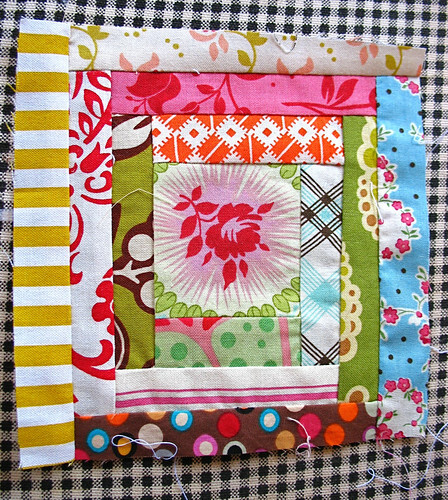 I've never been too excited about quilting just because of all the measuring and cutting and angles and stuff. But this I can do. It just requires a 2.5 inch square in the middle surrounded by 1 inch strips. You use a 1/4 seam allowance and keep going until you have 12 outer fabrics. Then trim it down to 5.5 inches. I'm doing it kind of loosie-goosie but the tutorial explains it properly. Here's what I've got so far (and the piles I'm pulling from). 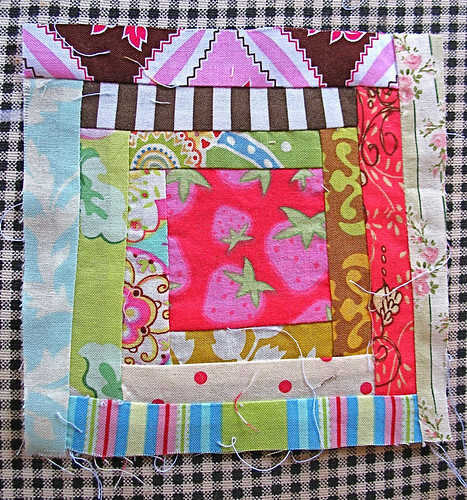 My goal is to make one a day just to allow myself some fun sewing time. If I get one done every other day though, I'll be happy with myself. I have just a scrap of that Amy Butler Temple Flowers print left so I'm glad to use it here in the middle so I can keep enjoying it. They're kind of wobbly but I think that makes them cute. I love the Flirt Tangerine Nosegay flower in the middle here. 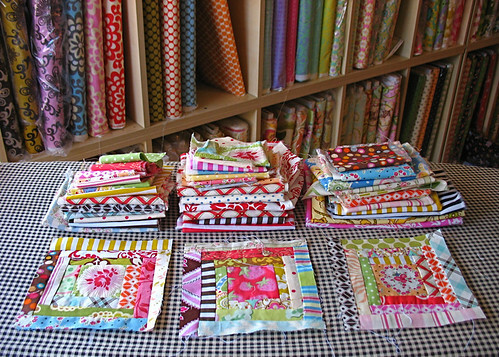 A huge thank you to those of you who are buying fabric from our new store! The Grand Opening sale is actually just a way to lure you in so we can work out the bugs on you and you won't complain because you're getting such great fabric at a great price! Thanks!! So far we've fixed the shipping, the missing fabrics, the mis-named fabrics and now we are working on the inventory lists. Fun stuff! Oh and I'll have some hot off the press, new fabric in stock on Saturday, yip yip!